Interpersonal skills outpace administrative skills, clinical training, and negotiation skills as the top leadership attribute to successfully lead health care organizations and physicians. Changes in the complexity of the health care landscape and a move toward value-based care are pushing organizations to include physicians in leadership structures once dominated by MBA CEOs. Shared leadership between physicians and administrators is in high use by health care organizations and considered extremely effective, very effective, or effective by 85% of respondents, according to the recent NEJM Catalyst Insights Report “Leading Physicians and Physician Leadership”. Just over 70% of Insights Council members say they use the dyad leadership model, which is a combination of business and clinical leaders, and 50% find it extremely effective or very effective. “Changes in the complexity of the health care landscape and a move toward value-based care are pushing organizations to include physicians in leadership structures once dominated by MBA CEOs,” says Stephen Swensen, MD, MMM, FACR, Medical Director for Professionalism and Peer Support at Intermountain Healthcare and Leadership theme advisor for NEJM Catalyst. These changes also have shot interpersonal skills to the top of the list of attributes necessary to successfully lead health care organizations and physicians today. Interpersonal skills, which 82% of respondents choose as top attribute to lead health care organizations and 90% choose as top attribute to lead physicians, rank higher than administrative skills, clinical training, and negotiation skills, which all scored 69% or lower. Just over half of respondents (53%) think physicians make better leaders of health care organizations than non-clinical leaders. 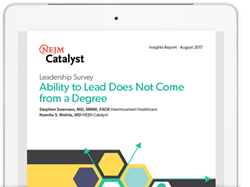 For more on the NEJM Catalyst Insights Report on Leadership, visit: http://catalyst.nejm.org/ability-lead-degree-dyad-leadership-interpersonal-skills/. An index of all NEJM Catalyst Insights Reports can be found here: http://catalyst.nejm.org/insights/.